"For I was hungry & you gave me something to eat, I was thirsty & you gave me something to drink..."
So i was looking for a crock pot dessert & stumbled across this one. It sounded good, it looked good- so i had to give it a go. 1. Beat cake mix, next 5 ingredients, and 1 1/4 cups milk at medium speed with an electric mixer (used my Kitchen Aid) 2 minutes, stopping to scrape down sides as needed. Pour batter into a lightly greased 4-qt. slow cooker. 2. Cook remaining 2 cups milk in a heavy nonaluminum saucepan over medium heat, stirring often, 3 to 5 minutes or just until bubbles appear (do not boil); remove from heat. 3. *Sprinkle cook-and-serve pudding mix over batter. Slowly pour hot milk over pudding. Cover and cook on LOW 3 1/2 hours. 4. (optional if using pecans) Meanwhile, heat pecans in a small nonstick skillet over medium-low heat, stirring often, 3 to 5 minutes or until lightly toasted and fragrant. 5. Turn off slow cooker. 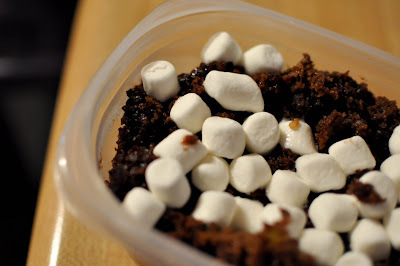 Sprinkle cake with pecans, marshmallows, and chocolate morsels. Let stand 15 minutes or until marshmallows are slightly melted. Spoon into dessert dishes, and serve with ice cream, if desired. It turned out almost perfect. almost. - the cook & serve pudding part. i followed the directions to a T (sprinkled the pudding mix on top- poured hot milk over that sloooowly) but the pudding & milk didn't seem to jive all the way. when i dug in i saw clumps of dry pudding mix or weirdly chewy chunks of cooked pudding. if i'd used chocolate pudding mix i may not have even noticed- but with the vanilla it was pretty obvious. so i think next time i'll actually whisk the pudding & milk together & then pour it on top & let it cook. chunks of un-cooked pudding = VOM! thankfully- they were easy to discard & the rest tasted awesome. i think next time i'll use a different cake mix too- i'm not a huge fan of german chocolate cake, so i'll grab a devil's food or something. 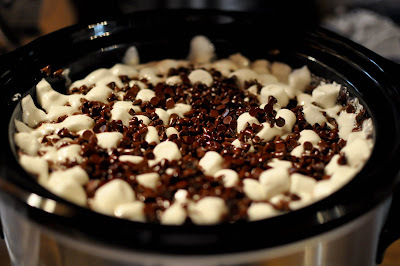 *i made this again & i mixed the pudding up BEFORE i poured it into the crockpot- SUCCESS! no nasty clumps & it was perfect! *i also used Devil's Food which i much preferred. *Lastly- i made the instant pudding = vanilla & the cook & serve = chocolate. so yeah- i say go that route! and there you have it- a crock pot dessert! So does that mean you made the instant pudding in vanilla flavor and mixed it per the instructions on the box and then mixed it with chocolate or what? I'm so confused by this, but I really want to try it right away! I'm with Shandel, I have NO CLUE what the last comment meant either! HELP PLEASE!!!! I Want to make this but am waiting for a response. I made this twice in 2 weeks for thanksgiving and then again for a party. It was amazing. Reminiscent of a molten lava cake, but honestly better. I did not have the same problem with the pudding, but I also opted for devil's food cake mix. It was amazing. Rave reviews from many folks. My only word of caution: DO NOT DOUBLE! i'm sorry ladies- i just saw your questions! 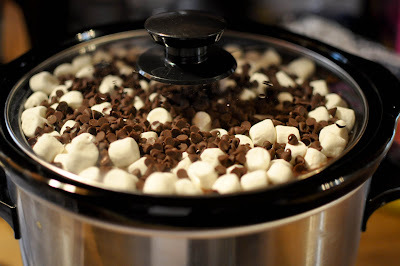 didn`t read it all the way but when you put all the stuff in the crock pot did you mix it all in there then put the marshmellows???? This looks great. I bet it would be a winner at a potluck. I'll have to try it next time. Do you think this would work with light sour cream? Also, could you do another box of instant pudding instead of the cook and serve? - you don't have to mix anything up once it goes into the crock pot-just before. & the marshmallows don't go in until the end! - i don't see any reason this wouldn't work with light sour cream! i'm not sure on the instant vs. cook & serve. i'm assuming there is a reason for the cook & server but i honestly don't know what- ha. i say go ahead & try- it'll probably work fine! I really want to make this for a pot-luck at work! You you think it would work if I put all the ingredients together as directed the night before, put it in the fridge overnight, then in the crockpot once I got to work? I used this recipe for Easter and it was a big success! I mixed the milk and hot pudding together and it seemed to work fine. Hi, I understand that you mixed the hot milk and the cook and serve pudding together before you poured it over the batter in the crockpot, but did you also mix the 1 1/4 cups of milk and the instant pudding together before mixing with the cake mix, eggs, sour cream, etc or did you just mix them all at the same time? 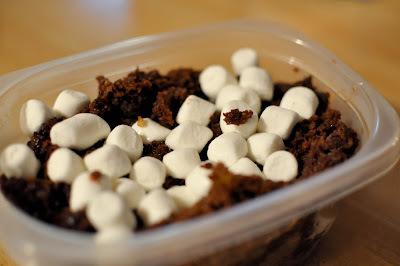 We also make these cake but it is much easier...Although I love the added marshmallows! Mix together cake mix as the package directs. Pour into crock-pot. Make Jello-O pudding using the milk. Pour over the cake mix in the crock-pot. Sprinkle chocolate chips all over the top of the batter. Cook in the crock-pot on high for about 2 1/2 to 3 hours until the cake is still moist but doesn't jiggle. Thanks for the update on this and it definitely sounds like a winning recipe! YUM! - i'm not sure if mixing it together the night before would work honestly. but i say try it! - Danni, the 1st 5 ingr. i mixed together at the same time! Do you make your cake mix like it says to on the box or just pour it in?? Beat cake mix, next 5 ingredients, and 1 1/4 cups milk at medium speed with an electric mixer (used my Kitchen Aid) 2 minutes, stopping to scrape down sides as needed. Pour batter into a lightly greased 4-qt. slow cooker. I made this today for a potluck dinner for around 50 people. I used your update, and stirred the cooked pudding before putting it in the crockpot. I also used SKOR bits on top. Result: I was cleaned out. It was gone in no time, and the compliments I received were never-ending. This is a FABULOUS recipe - and thank you so very much for sharing it. It's definitely going into my book as a keeper. I've already commented once on how good this is, but realised I didn't let you know that I tried it with a vanilla/pistachio combination - for occasions where chocolate is either overdone (potluck) or there are sensitivities to chocolate. It is also incredibly delicious. Looking at trying different combinations in the future. Thank you again!